Striking, classy, and beautiful are words that define the 1940s makeup. The makeup of the 40s was influenced by variety of factors. World War II dominated the time period, and although war production helped pull the America of the great depression, people were not wanton or wasteful. Makeup, although socially acceptable in this decade, reflected this sentiment. The style was based on natural beauty; simple and subdued, yet striking in nature. Many women became part of the workforce due to the war. They strived to look beautiful and feminine despite the prevalence of simple utility clothing. Makeup was one way a woman could accent her look, even in an androgynous factory uniform. The style of makeup in the 1940s relied on flawless-looking skin, long lashes, groomed but natural-looking brows, and a striking lip. Face: The face makeup for this era was designed to look naturally glowing. To achieve the look, women wore a foundation that was slightly darker than their skin tone. Then, face powder was applied in a slightly lighter shade. Eyes: In general the eye makeup of the 40s was designed to draw attention, but look natural. Grey and brown-toned eye shadows were used. Mascara drew attention to the eyes by framing them and darkening the lashes. Minimal mascara might have been used for day, but darker mascara or false eyelashes created a stunning, doe-eyed look for evening. Brows: Forget the pencil-thin brows. The 1940s embraced a stronger and fuller brow. Perfect eyebrows for women in the 40s were neatly groomed in a clean arch, and a brow pencil might darken or fill in any sparse areas. Lips: Red lipstick is a defining makeup look from this period. A woman's makeup was not complete without a beautiful red lip. Many shades of red were available, from lighter orange-reds to darker cherry and brick reds. The lighter more natural shades could be worn for day, and a darker lip color worn for evening glamour. Lip liner was also essential. The look called for a soft, full, slightly rounded lip, and women often exaggerated the upper lip to get the desired effect. Nails: To be in vogue in the 1940s, nail color should match your clothing. Many colors were available, from mustard yellow to navy to maroon, but reds and pinks were also very popular. Nail color was not applied to the tip or base of the nail; instead, a thin line of nail at the top and the half moon at the base of the nail were left unpolished. For a costume look, you can really have fun with the makeup from this period. Exaggerated, dark arched brows, long false eyelashes, and deep red lips will add flair to your costume. Although eyeliner wasn't prominently used in the 40s, you may want to line the eyes with a black liquid liner to help emphasize the eyes and to disguise the false lash strip base. Don't extend the liner past the eyes or it will detract for the simple, glamorous look you're trying to achieve. Don't try to mimic the foundation look of a darker foundation and lighter powder. This may end up looking unnatural. Instead, invest in a good primer and foundation in the right color for your skin tone and finish with translucent powder for a flawless looking finish. Use a light hand to add a touch or bronzer or blush to provide a healthy glow. Use lip liner to line your lips in a slightly rounded way, but don't extend the liner beyond the natural line of your lips. 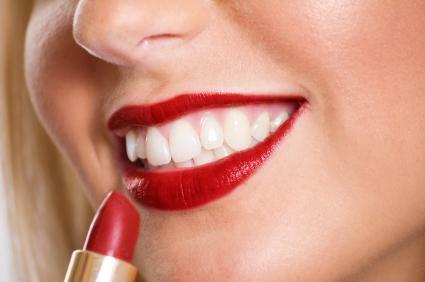 Use a lip stain or a long-lasting lipstick to keep your color going strong. Dark brown or grey kohl eyeliner can help emphasize the eyes and stay in keeping with the natural captivating look of the 40s. Create a thin line close the last base for the most natural effect. The classic sophistication of 1940s makeup is one that can be emulated with a little practice. Whether you want an exaggerated makeup style from this time period for a costume party, or simply want to rock the glamorous style inspired by this era, focusing on defined but natural-looking eyes and red lips are key. Add your own touches to make the look truly your own.